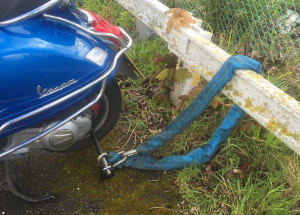 I'll start off by saying that no scooter can be made 100% secure. 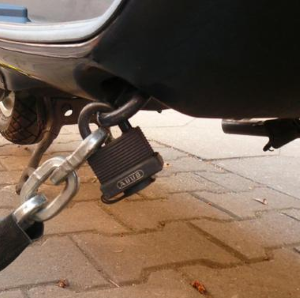 The aim of adding security to your bike is to move the thieves on to an easier target. Vespas are particularly vulnerable because they're easy to ride, relatively powerful and the inbuilt security is quite weak. In many countries security isn't an issue but in places like London owning a Vespa can be a nightmare with up to 30 Vespas stolen here each week. The issue is primarily with the GTS 300 and 250 models and the equivalent BV models. If you only use the security that comes with the bike then your bike will be stolen! How do they steal it? They can break the steering lock simply with a hard tug. Chains smaller than 16mm will be cut with bolt cutters. They will then "ped-push" your bike away using another GTS to provide the push. Your ECU will then be removed and replaced with one that's been cleared. At this point they can now ride your bike. 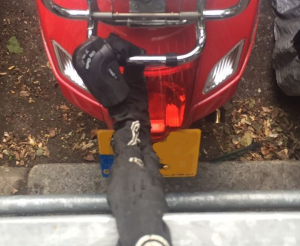 It's actually very rare for scooters to be lifted into vans. 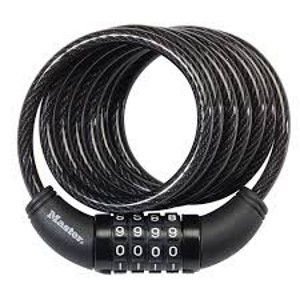 Disk locks - can be used on the front wheel and decent ones also offer moderate security. They are also easy to put on and quite small. The downside is they are easy to forget about when setting off so make sure you get a colourful one and always check you've removed it before setting off. Some locks have alarms which can be better but read reviews - the early Xena disk locks with the alarm had very poor quality metal. How you position the lock on the disk will affect it's sensitivity. 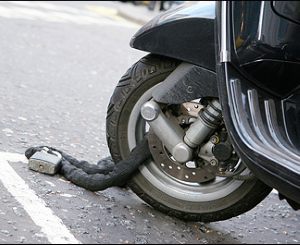 A chain - will allow you to lock your bike to something immovable but it needs to be through the rear wheel. You need a chain of 16mm to get moderately good security. Unfortunately the gap between the wheel and the disk isn't large so fitting a chain can be quite difficult. Pragmisis and Almax both produce good 16mm chains but keep in mind they're quite heavy and require a little practice to put though the back wheel. An anti-pinch pin - is an easier way of locking your back wheel. It needs to be used with an appropriate lock. A 250mm pin is suitable for the GTS. The pin works best when combined with a 16mm chain attached to something immovable. A bike cover - hides your bike from view but most thieves will just lift cover to see what you've got. CCTV - doesn't really deter thieves but does allow you to post a video after your bikes been stolen. DIY disabling switches - won't stop them from your stealing bike as they usually won't try to start it till they're safely away. If they can't start it then they'll just sell your bike as parts. 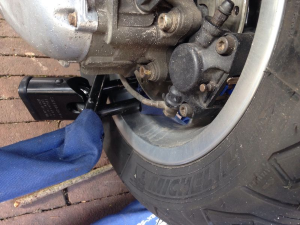 Locking wheel nuts - on the front wheel stop your front wheel being taken to steal another GTS. Bluetooth trackers - like TrackR, Tile or TinTag are similar to a normal tracker but rely on someone with the right app on their smart phone passing within 50-100 feet of your bike once it's been stolen. It's a nice idea but no where near as reliable as a standard tracker but these devices are quite cheap and their batteries usually last for a year. Alarms - in most modern cities we hear alarms going off all the time. It's debatable how much they deter thieves. Trackers - won't stop a thief but there's a fairly good chance of getting your bike back. Of course the steering column will be broken, your lock will have been broken and the ECU for your bike would of been taken. DIY Trackers can also be made out of an unneeded smart phone and using special alarm apps . The smart phone would have to be hidden on the bike and would need power yet also be accessible to turn on and off. Ground anchors - if you already use a good chain while parked at home then consider a ground anchor. Although it's easier to place a lock on the front wheel remember the front wheel can be removed very easily - disk locks are OK on the front though. In high risk areas consider an alarmed disk lock on the front and an anti pinch pin with chain on the rear. If you use a chain consider putting your chain through another bikes chain. In a high risk area like London it's well worth securing both wheels!